Related to my last post on Europa Report, a movie I discovered when I read these articles earlier today, and also in the category of things I somehow missed, NASA is planning a robotic mission to Europa. This is exciting since, as I noted in the movie review, Europa’s underground ocean makes it currently the most likely candidate for extraterrestrial life in the solar system. NASA wants to visit Jupiter’s moon Europa. Why’s that exciting? In a word: Water. 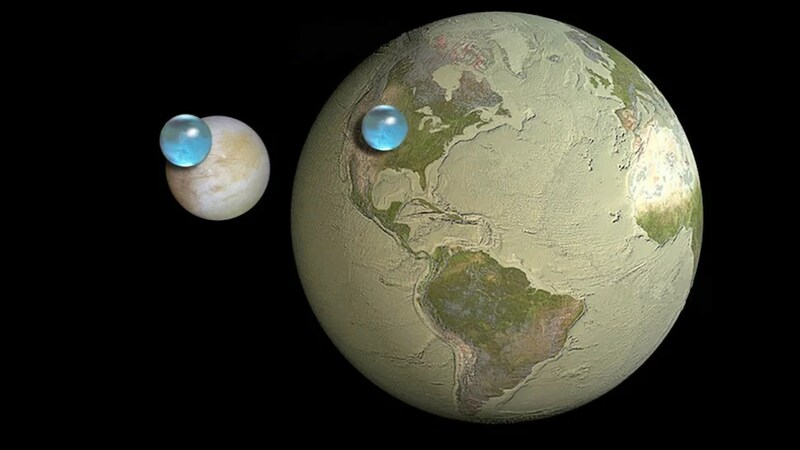 As this visualization shows, the icy moon may look tiny next to our own planet, but it’s got 2- to 3-times as much H2O as we have here on Earth. That “little” moon is packing quite the store of water — and with it, scientists think, a significant chance of harboring life. via This image is why everyone’s so excited about a NASA mission to Europa. It looks like it’s finally going to happen, an actual mission to Jupiter’s icy moon Europa — one of the the solar system’s best candidates for hosting alien life. Yesterday, NASA announced an injection of $17.5 billion from the federal government (down by $1.2 billion from its 2010 peak). Of this, $15 million will be allocated for “pre-formulation” work on a mission to Europa, with plans to make detailed observations from orbit and possibly sample its interior oceans with a robotic probe. Mission details are sparse, but if all goes well, it could be launched by 2025 and arriving in the early 2030s. via NASA plans a robotic mission to search for life on Europa. This entry was posted in Zeitgeist and tagged Europa, Extraterrestrial life, Icy moon, icy moon Europa, Jupiter, Jupiter's moon Europa, Nasa, NASA mission, robotic mission, Solar System, Space, space exploration. Bookmark the permalink. What’s really exciting are those water vapor eruptions that they found, since that means we might be able to get at the under-ice water in places without having to go through kilometers of solid ice. I just wish we could send the Europa Orbiter (with a lander!) instead of the simpler but still great Europa Clipper mission. There’s tons of outer solar system missions that I wish we could send. I wish we could do landers on Enceladus, Europa, and Titan, along with dedicated orbiters for either Neptune or Uranus. We might even be able to drop a probe into Uranus/Neptune if it could be designed to be buoyant at particular depths and pressures in its atmosphere. I agree. Those missions would be awesome. They’ll probably happen eventually. It’s amazing what we’re learning about the solar system with these robotic missions. As technology progresses, I think they’ll only get better. I was not aware that Europa had more water than us. Me either. Those kinds of graphics are very effective.